Cardiff City lost a fiercely contested FA Youth Cup tie against Hull City at the KCOM Stadium on Humberside. 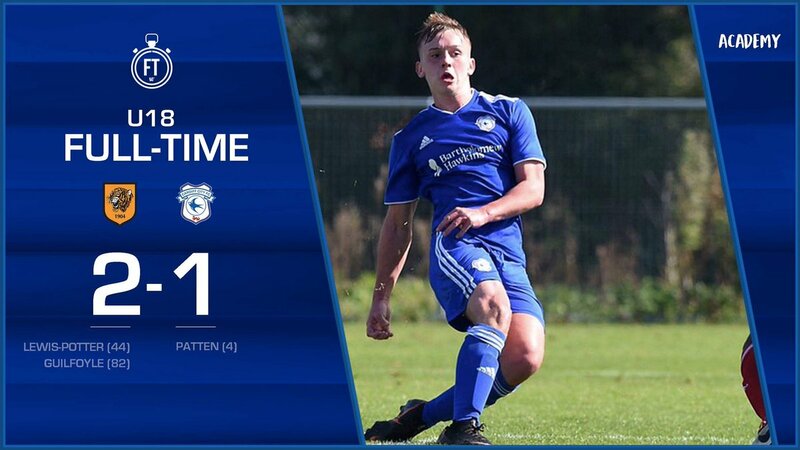 The young Bluebirds took the lead when Keenan Patten scored, while the home team had Ben Adamson sent off 10 minutes from the end. Hull, though, fought back to win 2-1 and take their place in the fourth round. Patten opened the scoring for the visitors after four minutes before goals from Keane Lewis-Potter and Rob Guilfoyle led Hull to victory. Former Cardiff City and Wales defender Terry Boyle is one of two coaches in charge of Hull’s youth team, working alongside John Anderson. The young Bluebirds worked hard in a close-fought tie, but were edged out after Hull fired their winner 14 minutes from the end. Cardiff went ahead when Patten’s strike from outside the box took a wicked deflection off a defender in black and amber and the ball went past goalkeeper Harrison Foulkes. The Bluebirds had the majority of possession in the early stages and almost nearly doubled their lead when Ben Margetson’s long-range effort hit the bar. Hull, though, worked their way into the match and Jacob Greaves forced Cardiff keeper George Ratcliffe into a fine save with a header from Dan Hawkins’ free-kick. Margetson did well to block a Hawkins shot, while Jake Nicholls won possession in a 50/50 challenge before finding Hawkins out wide. The winger went for goal, but his low shot flew wide. Cardiff should have doubled their lead when Harry Pinchard’s shot fell to striker Daniel Griffiths inside the penalty area. His initial effort was saved by Foulkes, but the ball fell favourably for the Cardiff striker and it looked a certain goal with the ‘keeper out of position. Greaves produce a last-ditch tackle rescue his team. Foulkes was called into action minutes later when he tipped Kieron Evans strike from distance over the bar, before producing a great tackle to stop Sam Bowen from scoring after the Tigers conceded possession in their own half. Adamson was the next to go for goal when he sent a header from Hawkins corner wide of a post. Hull equalised a minute before half-time when another Hawkins corner was met by Lewis-Potter, who rose majestically to head home – much to the delight of the 250 fans inside the KCOM. Foulkes was called into action early on in the second half, first saving from Connor Davies’ close-range effort before gathering Bowen’s fierce drive at the second time of asking. At the other end of the pitch, the dangerous Lewis-Potter continued to cause problems for the Cardiff back four and he sent a low shot towards the bottom corner after linking-up well with Hawkins, but Ratcliffe produced a smart save. The Tigers went ahead in the 76th minute when Lewis-Potter’s interception and pass played through Guilfoyle, who fired home into the bottom corner. There was still time for more drama as the Tigers were reduced to 10 men when Adamson was shown a red card for a late challenge, but Hull held on to win against a Cardiff team who are top of Professional Development League Under-18 South. Hull City: Foulkes, Nicholls, Jacob, Taylor, Adamson, Greaves, Hawkins, Best, Guilfoyle (Rouse 90), Lewis-Potter, Beckett (Smith 80). Subs not used: Cartwright, Wood. Cardiff City: Ratcliffe, C Davies (J Davies 62), Margetson (Mayembe 83), Reynolds, Bagan, Patten, Davies, Pinchard, Griffiths, Bowen, Evans. Subs not used: Kavanagh, Duffey, Jones.